Enter your zip code below to find current offers, dealers and models available in your area. The Exmark Quest is a great fit for homeowners looking to cut their lawns faster and easier. When you think about what your time is worth, it's easy to see the value of more productive tools. Deck widths from 34" to 42"
The new Quest mowers give home and acreage owners the power to simultaneously increase the beauty of their lawn and reduce the amount of time it takes to get done mowing. Deck widths from 50" to 60"
Exceptional comfort and cut quality at an unbeatable value. Deck widths from 44" to 60"
Exmark Radius S-Series delivers the cut quality and durability professionals demand at an unbeatable value. Deck widths from 48" to 60"
Delivers the cut quality and durability professionals demand at an unbeatable value. Deck width starting at 60"
Exmark Radius X-Series delivers the cut quality and durability professionals demand with a host of new features and innovations. This mower strikes a perfect balance of value and performance featuring a Deck Support System, Simplified Hydro-drive, Unibody Frame and available with a Rear Discharge Deck. Deck widths from 48" to 72"
This mower is tough and built to last. Available with the EFI System that optimizes Fuel Delivery, and Gas-powered models with a single 12-gallon tank which means less time at the pump. Our top-of-the-line series features RED Technology, a Simplified Hydro-drive, Ultracut Series 6 Deck and a new level of comfort with our patented Iso-Mount Seat Isolation System. Deck widths from 52" to 72"
For a variety of reasons, the redesigned diesel-powered Lazer Z mowers may be the right choice for your cutting needs. Deck widths from 60" to 96"
Thanks to the Navigator's patented fill-reduction fill reduction and larger-diameter blower, you get the perfectly mowed lawn in less time. This zero turn mower is perfect for any pro who wants even more control and responsiveness. Deck widths from 42" to 48"
Getting the work done faster with Zero Grease Points, Single-Speed Transmission and a Multi-Purpose Blade. Deck width starting at 21"
It is tougher and faster, with the Patented Front Height Adjustment, Signature Cut with 4.5" Deep Deck and Single-Point Rear Height Adjustment. 3-in-1 cutting system featuring; Easy Maneuverability, Twin-Blade Efficiency and Simplified Maintenance. Packing more technology and performance into this walk-behind with Simple Drive Belt Maintenance and All-Round Performance. Deck widths from 32" to 48"
Our Patented Hydro Quick Track Adjustment and Exceptional Traction make this Operator-Friendly walk-behind one of the best in our line up. Deck widths from 36" to 48"
Engineered for speed and efficiency with Turnkey Operation, Virtually no need for Tire Repair all while providing Ultimate Operator Comfort. The industry leader in walk-behinds with Patented Enhanced Control System, Superior Air Filtration and Ultimate Clutch Performance. Commercial performance and increased maneuverability all in a compact design. Deck widths from 32" to 44"
Raising the bar for stability, ease of use and operator comfort, with the commercial performance customers expect. A revolutionary stand-on riding mower with electronic fuel injection. Equipped with the UltraCut Rear Discharge cutting system, the Lazer Z E-Series strikes the perfect balance of value, performance and versatility. Deck widths from 60" to 72"
Exmark&rsquo;s top-of-the-line zero-turn riding mower is now available with the UltraCut Rear Discharge cutting system, for the ultimate combination of productivity, durability and quality of cut. Durable diesel power and a heavy-duty welded tubular steel unibody frame combine with Exmark&rsquo;s UltraCut Rear Discharge cutting system to deliver productivity and reliability you can count on. Deck widths from 72" to 96"
Turf Tracer&reg; S-Series: Made-to-order performance in a floating-deck, Hydro-drive mower. Deck width starting at 48"
Turf Tracer X-Series: The walk-behind that is miles ahead of the competition. A mower that fits in almost anywhere, including on high-end properties. The next generation of RED Technology is now available on Lazer Z S-Series models. Our top-of-the-line series features patented RED Technology, a Simplified Hydro-drive, Ultracut Series 6 Deck and a new level of comfort with our patented Iso-Mount Seat Isolation System. The next generation RED leverages the latest technologies to deliver increased machine efficiency, ease of use and durability. Enhanced operator comfort meets Lazer Z productivity. It's the perfect balance of value and performance and operator-focused design. 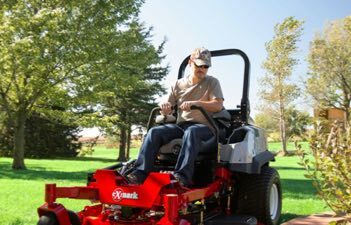 Paired with our top-of-the-line zero-turn riding mower, the suspended operator platform delivers the ultimate combination of productivity, performance, durability and operator comfort. The standard of excellence for operator comfort, set by the Exmark Lazer Z Suspension Platform has expanded to Radius S-Series models. Widths from 24" to 30"
This Commercial Grade Aerator features Infinitely Variable Drive Speed and Powered Reverse, 3-Position Adjustable Handle, Heavyweight Performance for Compact Soils and Heavy-Duty, Self-Cleaning Tines that pull 4.6 plugs per square foot. With Four-Season Versatility the Rotary Broom is an essential tool for landscaping featuring Simple Height Adjust and our Patented Power Steering System. Perform three jobs with every pass with the large diameter mixer regulating seed flow based on ground speed, featuring a 40-pound seed hopper for large jobs without stopping and Durable Steel Blades. Easy to operate and maneuver with Innovative Lean-to-Steer Technology, state-of-the-art Agitation System and Intuitive Controls keeping everything right at your fingertips. Please select a dealer partner to view all offers available in your region. Exmark Manufacturing was incorporated in May 1982 as an independent manufacturer of professional turf care equipment.The company began its manufacturing operation with seven employees in a garage-type building located just south of Beatrice, Nebraska. In 1983, the company relocated to its present location in the Gage County Industrial Park in Beatrice. At that time, the company focused on manufacturing a line of mid-size walk-behind mowers and turf rakes. In 1987, due to the rapidly growing turf care equipment market and the competitive nature of that market, the product line was expanded to include commercial riding mowers. Exmark sells its products through a network of dealers. Use the features below to find Exmark operator and parts manuals. If you do not find what you are looking for or have questions, please contact customer service at 800.667.5296.